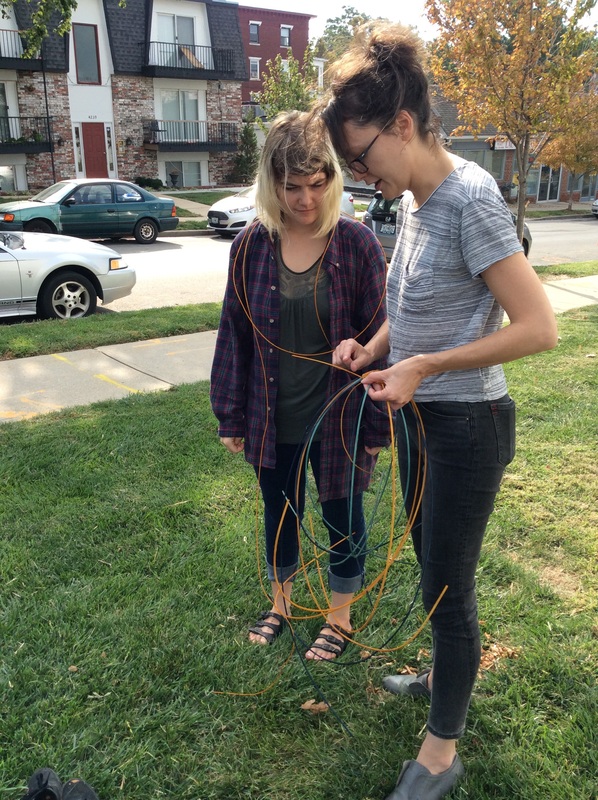 KCAI FIBER | News, resources, art and ideas! Two Kansas City Art Institute Students, Lauren Chasten (’16 fiber) and Kara Dunbar (’15 ceramics), will have work featured in the upcoming 6th National Collegiate Handmade Paper Art Triennial, a competition in artworks created in handmade paper. 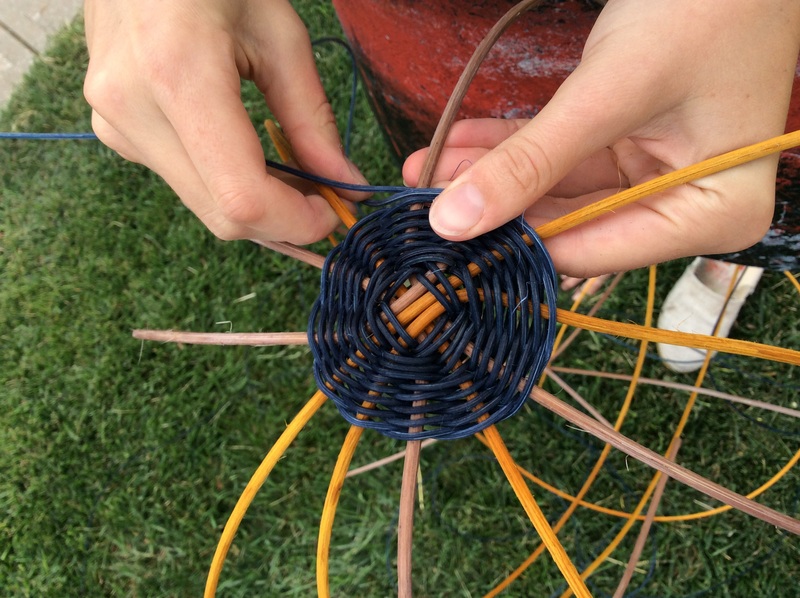 After taking Marie Bannerot McInerney’s, Fiber to Form fiber elective, these students were among five selected by the department to compete nationally. Anne Q. McKeown of the Brodsky Center of the Mason Gross School of the Arts at Rutgers, the State University of New Jersey and Lynn Sures of the Corcoran School of the Arts and Design, George Washington University, Washington, DC, co-direct the Triennial. The distinguished juror, Joan Hall, put together a selective exhibition of 21 works from over 170 competitive images she viewed. These were submitted by 12 papermaking programs at undergraduate and graduate universities, colleges and art schools nationally. The show will be a diverse and high-quality representation of art currently being made of handmade paper. The traveling show begins with an opening February 18 at 5pm at the The Corcoran School of the Arts and Design in Washington, D.C. and will travel to the Morgan Conservatory in Cleveland, OH. The Silent Type is Rochelle Brickner’s KCAI Senior Thesis Exhibition, as well as her second solo exhibition in Kansas City, Missouri. The installation is comprised of biomorphic forms that are inspired by the textures, colors, and life cycles characteristic of various species of fungi. Reinterpreting the environments they inhabit in natural and controlled compositions references their various stages in life. 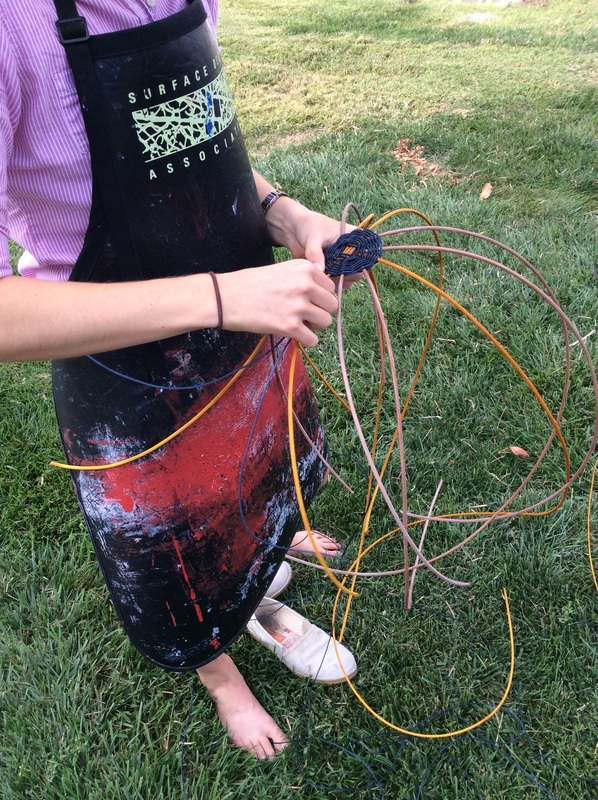 Brickner’s preferred materials are wool and paper intermingled with other natural mediums. 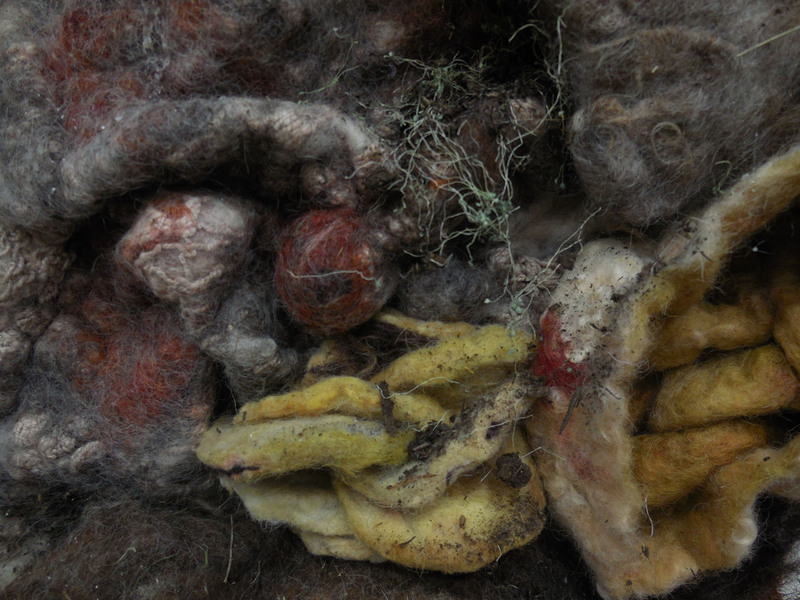 Like human hair, wool is a shapeless, fibrous material that can be endlessly manipulated, in this case through the process of felting. 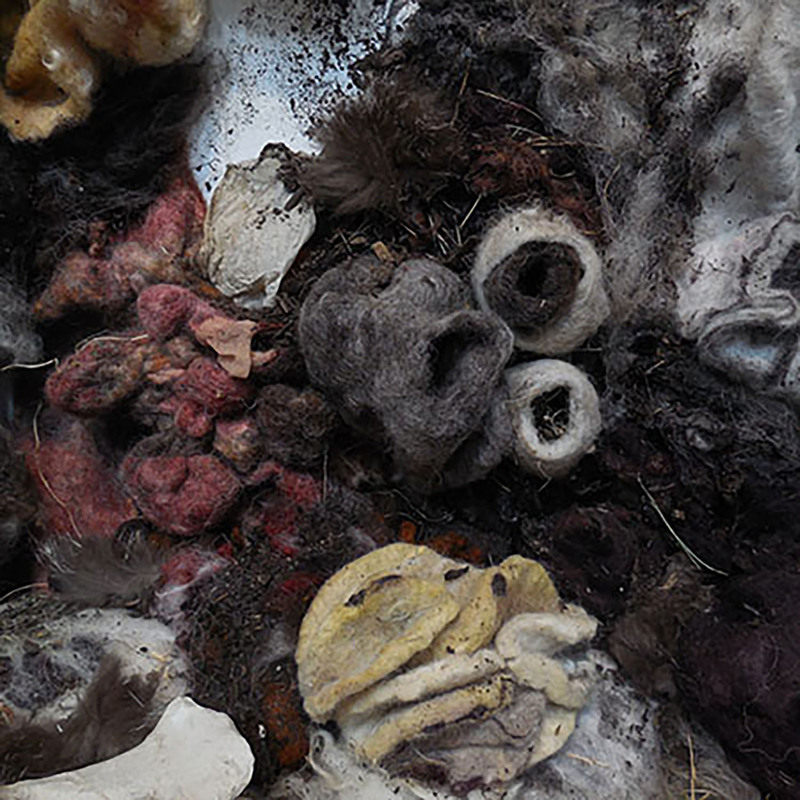 While transforming the wool into mimicked fungi forms and then later reinterpreting environments they inhabit with their installment, de-installement, and re-installment accompanied with new additional forms, Brickner is in essence mimicking a nutrient cycle, referencing their various stages in life: growth, rebirth, decomposition, and symbiosis in nature. The choice of materials used and the processes of construction and transformation are intimately connected to the visual, conceptual and narrative aspects of the work. Rochelle Brickner (b.San Antonio, TX, 1973) is a Kansas City based mixed-media artist. Her other interest articulating environmental awareness has inspired her to lead youth directed environmental art workshops in Kansas City with Greenworks KC, Boy Scout Troop 25, and the Plaza and Central Public Libraries. She has exhibited in several venues within the Kansas City Metropolitan area, including a solo show at Contours Hair Salon, and group shows at Mattie Rhodes Art Gallery, Little Miss Elegant Gallery, and Kemper at the Crossroads. 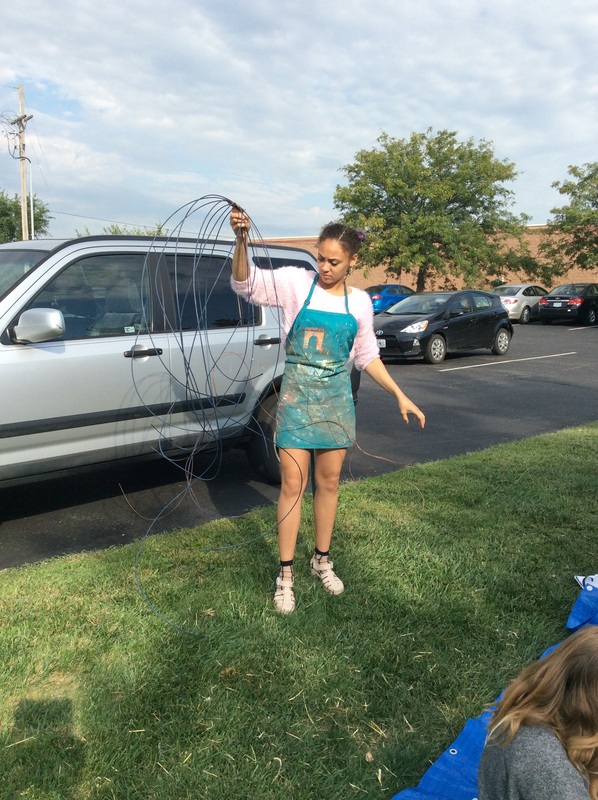 Brickner will graduate with a BFA in Fiber from the Kansas City Art Institute in December 2015, and thereafter pursue the post-baccalaureate art education certification program at the Kansas City Art Institute. Brickner is also known for making fine art and utilitarian textiles, and more specifically, features a line created by using up-cycled materials known as Repurpose Me. Repurpose Me has been featured in Ink Magazine, the Kansas City Star; and interviewed on 90.1, Kansas City public radio. Some of Brickner’s textiles can be found in the Kemper Museum of Contemporary Art museum shop and in her RoBO Textiles Etsy shop. For more print quality images available upon request and/ or further information, please contact Rochelle Brickner at robotextiles@gmail.com or at 816.590.2792. WHAT: We Start Here: The Fort Festival! We Start Here is an explorative collaboration between young men at the Gillis school and local artist Olivia Clanton. Each project begins with a student imagining his dream fort, and then the child works with the artist to translate his images and stories into a space they build together. This project aims to provide a creative release for the child, encouraging him to become an active problem-solver, and enabling him to re-imagine a future in which he is the architect. The project encourages the child to travel to a space of trust and creativity. Children who are provided with individual attention and the opportunity to insert something they have imagined into the world can experi- ence uplift and a sense of self-confidence. It also challenges the way people interact with at-risk children. Visitors are invited to listen to persons they might have otherwise overlooked and to discover places they might not otherwise have come to know. These resourcefully imagined spaces offer an opportunity for greater connectivity in our community, and empower young people to celebrate their individuality and creativity. For the month of December we are happy to bring back this very popular exhibit and excited to celebrate the Feast of Our Lady of Guadalupe in our gallery. La Reina (or the Dark Virgin) is both a religious icon and cultural symbol that goes beyond words in both traditional and contemporary significance. This exhibition is looking for works that explore the meaning, context and translations of this figure as it has been used religiously, socially, and throughout our pop-cultural landscape. We accept submission from all artists, both local and national that hope to extend the conversation, interpretations and vision of Our Lady/La Reina. Download the Call for Artworks/Artists packet for La Reina: Our Lady of Guadalupe below, via one of the two links. Please consider submitting something amazing to a very popular exhibition that shows annually at Mattie Rhodes Center Gallery , closing out the year nicely. 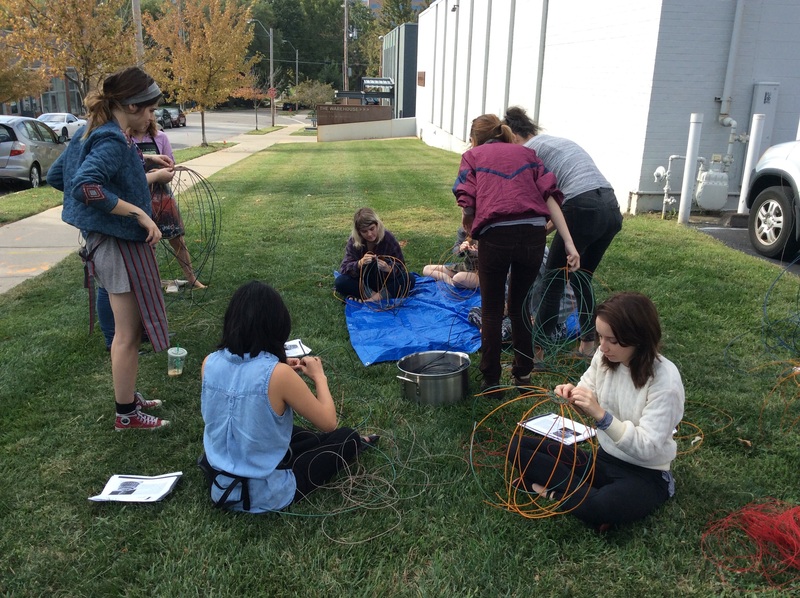 The junior class, led by Marie McInerney, learned basketry techniques earlier in the semester. ….and have a nice week! 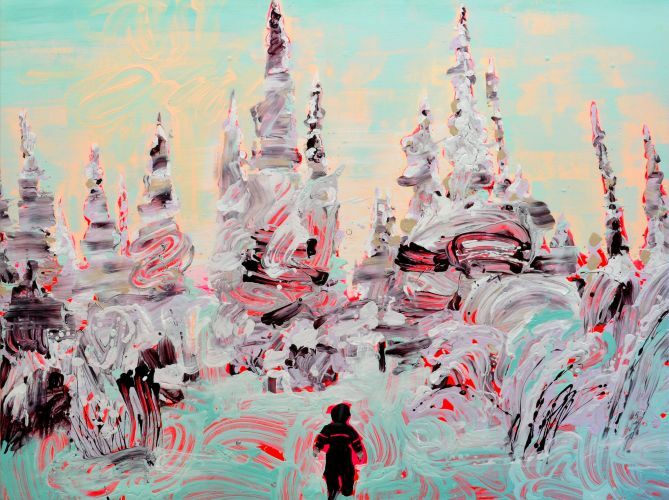 Dark Days, Bright Nights: Contemporary Paintings From Finland. International Painting Exhibition Opens October 2 at Kemper Museum. Free | Friday, October 2, from 5:00–6:00 p.m. is a CASH bar and FREE live music. 6:00 p.m. continues a FREE artist panel. Exhibition curator Barbara O’Brien moderates a discussion with artists Jarmo Mäkilä and Vesa-Pekka Rannikko. Enjoy live improvisational electronica music by Kansas City–based Mnemosyne Quartet, and talk with docent guides in the exhibition throughout the evening. 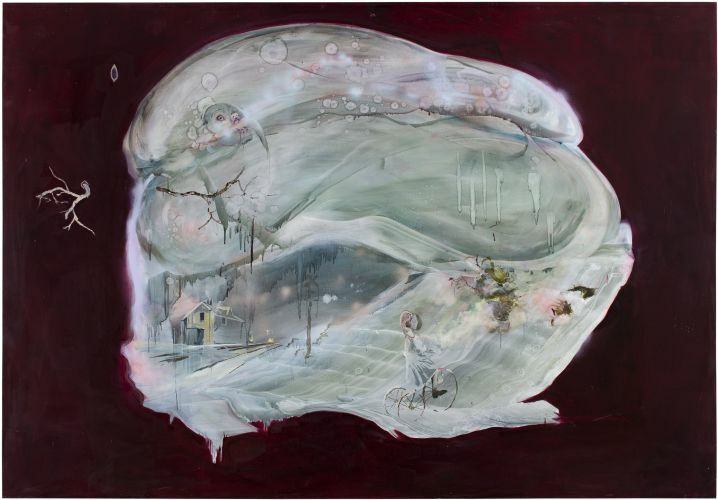 Dark Days, Bright Nights: Contemporary Paintings from Finland will be on view at Kemper Museum of Contemporary Art from October 2, 2015, through February 21, 2016. 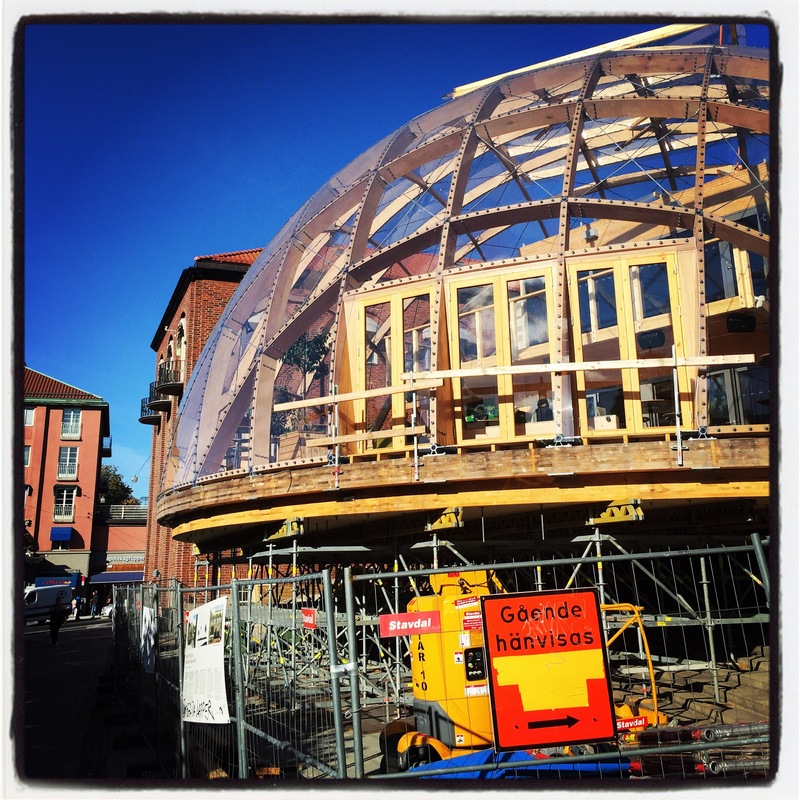 With days of 24-hour darkness in the winter months and 24 hours of sunlight during the summer, what is real and what is a dream can seem a narrow distance apart in this most northern of the European countries. Dark Days, Bright Nightsis curated by Barbara O’Brien, executive director Kemper Museum of Contemporary Art, Kansas City, Missouri. “My travels in Finland allowed the opportunity to create a portrait of a time and place where support for the arts has been strong, and the notion of the painter as a respected cultural worker is palpable,” said O’Brien. Admission to the Kemper Museum and this special exhibition is free. The 13 artists represented in Dark Days, Bright Nights were all born in Finland, and now work in locations including the city and countryside of Finland as well as Berlin, New York City, and Stockholm. Artists include Jani Hänninen, Heikki Marila, Marika Mäkelä, Jarmo Mäkilä, Rauha Mäkilä, Reima Nevalainen, Leena Nio, Vesa-Pekka Rannikko, Mari Rantanen, Mari Sunna, Nanna Susi, Sirpa Särkijärvi, and Anna Tuori. The artists selected represent a wide range of experiences and painting styles, but are connected by the Kemper Museum’s philosophical focus on investigating the history of the gesture in painting and in creating a conceptual and art historic bridge from the 20th to the 21st century in both exhibition program and the Permanent Collection. Jarmo Mäkilä’s narrative tales of country life in the shadow of WWII are a counterpoint to the 21st-century inspiration of cityscapes and graffiti in works by Jani Hänninen. The relationship to the natural world, so important to the Finnish people, is vividly realized in the paintings by Lapland artist Sirpa Särkijärvi. The space between waking and sleeping seems to come to life in the snow-globe-like paintings by Anna Tuori. The desire to control and genetically manipulate nature is explored in a video installation by Vesa-Pekka Ranniko. A full-color catalogue accompanies the exhibition, and is available for purchase in the Kemper Museum Shop. The catalogue provides art historical scholarship and cultural context to the exhibition and includes essays written by Peter MacKeith, Honorary Consul General to Finland; Timo Valjakka, an independent writer, curator, and critic based in Helsinki and London; and curator O’Brien. Support for the Kemper Museum is generously provided by members and donors, especially Frame Visual Art Finland, and The Ministry for Foreign Affairs and the Consulate General of Finland. Financial assistance for this project has been provided by the Missouri Arts Council, a state agency. This project is supported in part by an award from the National Endowment for the Arts. 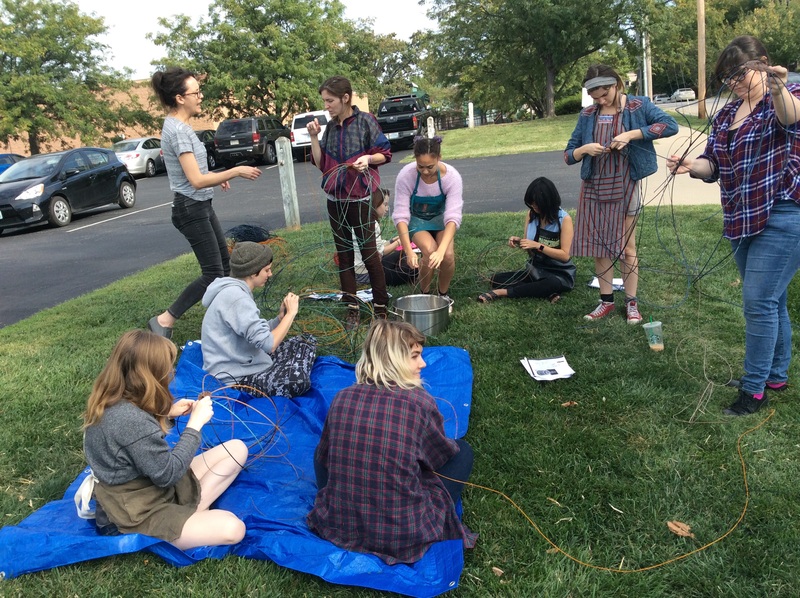 The Fiber department at the Kansas City Art Institute recently went on a field trip to Plug Projects. There, one of our favorite faculty members at KCAI, Marie McInerney, gave a presentation not only on Plug programming, but also about her piece in one of the galleries as well as what she knew about the other artist, Sonja Dahl, currently exhibiting there. *unPLUGGED is a series of exhibitions that occur outside of the Plug Projects gallery space in which Plug works with galleries and organizations outside of the Kansas City area to promote the work of Kansas City Artists in the national arena. *Critique Night Series happens in-between exhibitions. Crit nights feature a small rotating panel of artists and art professionals in the community who participate in live dialogue (open to contribution from the public) with local artists about their work. As I am not an art critic but rather an informer, it is difficult for me to give a perspective on the work being shown at PLUG. I WILL share that after seeing both exhibitions twice, I experienced something meaningful and different each time. Both of the installations are very poetic and definitely thought provoking, AND worth the trip down to the stockyard district in Kansas City where you can eat or have a cocktail next door at Voltaire. Thought some of you might like to know about the…..
Also, some other things to consider……. This 100%Wool Persian Yarn is ideal for needlepoint. The plies can easily be separated to cover the different sizes of canvas. One strand of the three ply yarn will nicely cover a 13-count canvas. Although this product is designed expressly for needlepoint, it is also a wonderful knitting yarn. It knits at 3 stitches per inch on size 10 needles. There are approximately 164 yards in the four ounce skein. There are over 100 colors to choose from. Some of the hanks are cut for needlepointing and some of the hanks are still whole. Full skeins can not be cut. Knitters – don’t miss this. Get a sweater or poncho’s worth for next to nothing. Consider hats and fingerless mitts. This upcoming Friday, September 18th, marks the opening reception of two solo exhibitions taking place at PLUG Projects, located in the Stockyards District of Kansas City. The front space at PLUG projects presents Between Blues, a solo exhibition featuring Sonja Dahl and the Local Solo space in PLUG Projects will present …or the stories we tell ourselves, a solo exhibition featuring the work of interdisciplinary studio artist and Assistant Professor in the Fiber Department at the Kansas City Art Institute, Marie Bannerot McInerney. KANSAS CITY – Opening September 18, 2015 PLUG Projects is pleased to present, …or the stories we tell ourselves, in the Local Solo space, an exhibition by Marie Bannerot McInerney. In her installation, McInerney examines our sources of knowledge and the variability of our shared history. Her process driven work utilizes the properties of found materials and recontexualizes them through methodic augmentation. 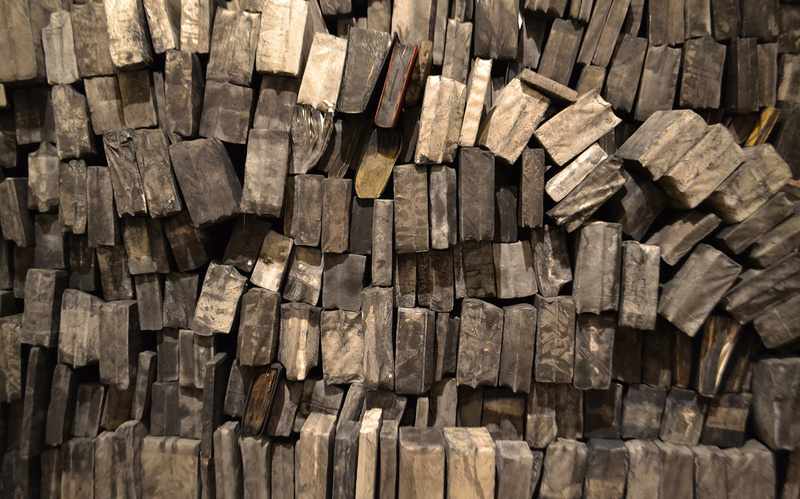 For her new installation at Plug Projects she will construct a pyramid form with roughly two thousand collected books that have been laboriously sealed within handmade paper skins and dipped into black ink. Set against an atmospheric sound piece, the redacted texts call to question what we know, what we don’t know, and who controls our narrative. KANSAS CITY – Opening September 18, 2015 Plug Projects is pleased to present, Between Blues, a solo exhibition by Sonja Dahl which engages ideas of communities, collectives and collaboration. Her recent works involve looking at the complex relationships between humans and the natural and constructed worlds we live in. Utilizing the deep blue of indigo dye and of cyanotype prints, Dahl instrumentalizes natures “blues” to actively respond to our contemporary ecological devastation. Sonja Dahl is an independent artist and researcher with a fluid, traveling, and collaboration-focused practice. She is a founding member of Craft Mystery Cult (United States) and has worked with The Poetic Everyman Project based out of Indonesia and Australia. Her 2012-2014 research projects in Indonesia, supported by the Fulbright Foundation and Asian Cultural Council, focused on the culture of collaboration, artist collectives and participatory projects in Yogyakarta’s contemporary arts, as well as in-depth study of batik, ikat weaving and indigo dye production in Java, Bali, Sumba and Flores. She holds a Master of Fine Arts from Cranbrook Academy of Art, 2012. Her artwork has been exhibited nationally and internationally, most recently at Bezirksmuseum Neubau, Vienna, Austria; The Darwin Visual Arts Association, Darwin NT, Australia; and The Museum of Contemporary Craft, Portland, OR, USA. Her writing is published with Carets and Sticks Contemporary Arts online, Textile: The Journal of Cloth and Culture, Dilettante, and forthcoming in Surface Design. PLUG Projects is a curatorial collaboration and exhibition space run by six Kansas City artists who share the mission of bringing fresh perspectives and conversation to the local art community. Our goal is to energize artists and the public at large by exhibiting challenging new work, initiating critical dialogue, and expanding connections of artists in Kansas City as part of a wider, national network of artists. PLUG Projects presents bi-monthly exhibitions featuring national and international artists who are actively challenging contemporary perspectives in all disciplines. Accompanying each exhibition, PLUG’s program includes critique nights, a curated blog, interdisciplinary events, lectures and studio visits to contribute to greater artistic dialogues. PLUG Projects is in the Stockyards District of Kansas City, Missouri at 1613 Genessee Street, 64102.